Home > Unusual Watersports > What is Wakeskating? Wakeskating is a popular new way to ride the water in pursuit of heady thrills, but what actually is it and how does it differ from the many other water-based board sports? Muscling in on the already busy and vibrant board watersports scene is the new sport of wakeskating, a thrilling new discipline that involves participants deftly balancing on a buoyant board whilst being pulled across the water by a speeding motorboat. But haven’t we been here before – so far it sounds very much like wakeboarding. So what is the difference? What is the Difference Between Wake Skating and Wakeboarding? Wakeskating is modified version of that popular watersport. As heir to the wakeboarding family it inherits not only the basic board pulled across the water set up but also a similar maple or fibreglass board design. The key difference is that wakeskaters are not bound to their board in any way, thereby letting loose an array of new challenges and tricks. Instead of the rider’s feet being tied to the board with rubber binds, the top of wakeskate boards are covered with grip tape or soft foam to provide a degree of traction for the riders. Skaters also typically wear special shoes whilst riding for that vital extra board purchase. Such measures can be the crucial difference between a deft and mind-boggling manoeuvre and an untimely duck into the water. As with wakeboarding, wakeskaters are more concerned with tricks than cruising across the water at speed. Such tricks are performed both on the surface of the water surface and in the air using the wake of the boat. Wake skating tricks tend to be more technical than those of wakeboarding. An analogy could be that wakeskating tricks are more like those of skateboarding whilst wakeboarding leans more towards snowboarding. 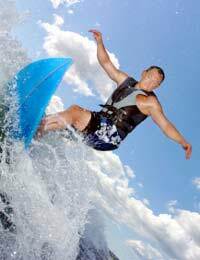 The evolution of wakeskating can be seen to date as far back as the late 1970s when ‘freeboarding’ and ‘wakesurfing’ first introduced the concept of riding boards free-footed behind motorboats. The big difference with this earlier form was the use of long surfing style boards. As the sport developed the boards became smaller as it allowed greater potential for tricks, such as launching in the air of the wake and ollies. However, wakeskating failed to take off at this time because the watersports industry moved towards board bindings, resulting in the emergence of wakeboarding. The sport eventually took hold in the mid 1990s in the United States, and has continued to grow ever since, picking up youth following across the globe. One of major draws of wakeskating over wakeboarding is that riders don’t need to know someone with a large and expensive motor boat. Unlike wakeboarding, wakeskating doesn’t necessarily require the boat to make a great wake. In fact wakeskaters can be towed by high powered jet skis, if the action takes place on shallow water where obstacles are provided for use with tricks.